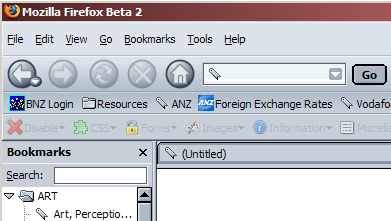 In one of my beta-happy fits, I upgraded from Firefox 1.07 to the current beta (1.5 b2). 1.07 had started acting funny (either a Windows hiccup, or a pesky extension I uninstalled), so I decided to go straight to the beta version. It’s looking good and working pretty good too … but but but! A lot of themes are not yet updated for the beta. So I was scrapping around for some supported themes which fill my requirements of being fairly neutral/unobtrusive and compact. 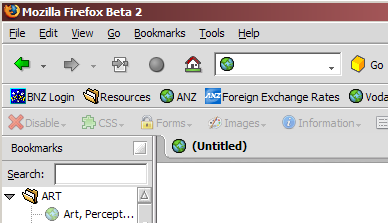 Sad to say, many Firefox themes are so-so from the design point of view. However, the haul was not without a few good and usable ones. I’ll show a few screenshots here of what they look like in my browser window – I find the posted screenshots at mozilla.org not always very helpful; and I do like to see what the bookmarks in particular look like. I like both ifox and Azerty best. Honorable third goes to Haikufox for good usability (everything is well-spaced).